Secretary-General of the United Nations Antonio Guterres arrived in Cairo Monday on a two-day visit. He was received by Deputy Foreign Minister for African Affairs Hamdy Sanaad Luza and UN Resident Coordinator in Egypt Richard Dictus. 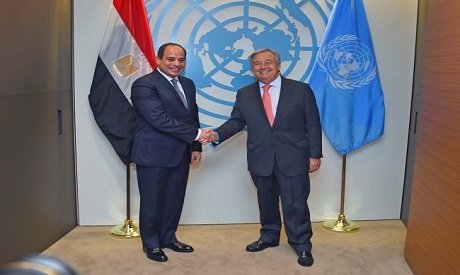 Guterres is due to hold talks with President Abdel-Fattah El-Sisi. He is also planned to meet Azhar Grand Imam Ahmed El Tayyeb to express his solidarity and underscore the need to fight the scourge of Islamophobia, as well as all forms of hatred and bigotry.